This was the news Omer Rains heard from doctors when he awoke from a prolonged coma and found the right side of his body completely paralyzed, the result of a stroke and brain aneurysm that nearly killed him at age 61. But the former California State Senator—a politician on the global stage, a power-broking lawyer of A + celebrities, a conqueror of some of the highest summits in the world—wouldn’t listen. Rains should have been leveled by his life-threatening health crisis, as most anyone would have been. But he was a stubborn fighter, one who many times in his life had defied the improbable, if not the impossible. “Back to the Summit” is Rains’ story of his harrowing, yearlong journey toward recovery as he pushes the limits of human potential: Against all odds, Rains teaches himself again to walk, and then to play tennis, aggressively bike, ski, and engage in other such activities again. But as the reader quickly discovers by way of flashbacks and flash-forwards, nothing about Rains’ life has been normal. Even before the aneurysm and stroke, his remarkable life story in and of itself is as captivating as any story can be. From humble beginnings—picking cotton at age eleven to supplement the family’s income—Rains struck out on his own at age 15 and rose to incredible heights fueled by a powerful mix of passion, tenacity and sheer will. He would eventually play a part in some of the most fascinating events of the 20th century. As a lawyer, Rains represented behemoth corporations such as Tele-Communications, Inc. (TCI), Liberty Communications and Media, Ticketmaster, The Sacramento Union, and the Sacramento Kings of the NBA; as well as people and causes that shaped the nation, from the civil rights movement to the environmental movement. He rubbed shoulders with stars of all stripes: Corporate titans such as John Malone, Bob Magness, Bill Bresnan, and Leonard Tow and famous Hollywood personalities including Steve McQueen, Johnny Cash, Charlton Heston, and many more. Rains’ influence eventually stretched well beyond that of a normal lawyer and State Senator: During the Camp David Accords of the late 1970s he met with Menachem Begin and Anwar Sadat; at the invitation of Nelson Mandela, he consulted for the South African Constitutional Revision Commission. He flew on Air Force One, dined and danced in the White House, and was close to both Jimmy Carter and Ronald Reagan. He had once been at the top of his game and he was determined to be there again. Yet it is the aneurysm and associated hemorrhagic stroke, and his white-knuckle recovery from paralysis, that worked to shape Rains’ life and worldview more profoundly than any of the people, places or events that came before. In trying to walk—and live again—Rains reveals the brave wisdom that you must fail first before you can truly succeed. And Rains sets the bar for “success” higher than most: achievement beyond all expectations and commitment to changing the world for the better. 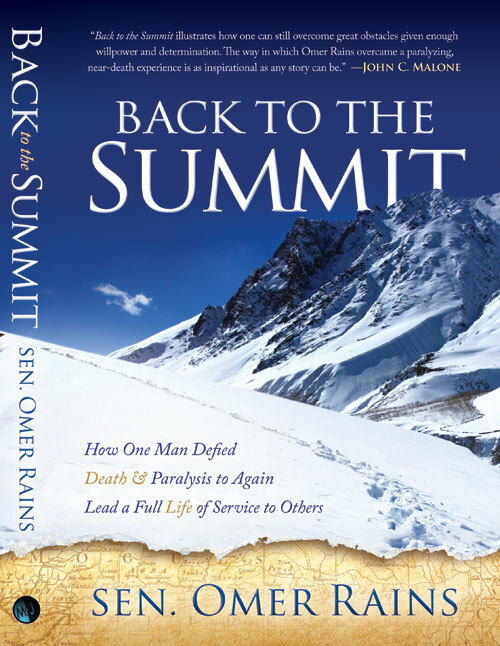 In “Back to the Summit,” Rains takes readers on a courageous journey toward recovery, both physical and spiritual, as he reflects on the people, events, and American history that shaped his life and gave him the strength to dare to walk again. Every flashback to the past offers insight into the philosophy that throughout his life has defined his every action: “When you get knocked down, pick yourself up and forge forward – – always forward.” Every story of the hardships and obstacles faced offers hard-earned lessons to overcoming challenges, no matter how great. Those who have suffered physical trauma may find hope in his story; their loved ones may gain insight and understanding. And any reader who has ever faced a mountain of a setback may be inspired to keep on fighting to live again.